It has been an almost nightly ritual for me: Trying to get as much stuff done and copied and posted by 5:00 pm when the mail would be picked up at my Chicago office building. Some nights, particularly in the rush to Christmas, the letter carrier might be delayed until 5:20 or even 5:30 p.m. But, says the Sun-Times this morning, my ritual has ended: The Postal Service, citing both budgetary and security concerns, has discontinued 5:00 p.m. mail pick-ups in Loop office buildings. Lisa Donovan's story quotes Chicago postal service spokesman Mark Reynolds as explaining that the late afternoon pick-ups were discontinued "in larger part out of security concerns, and then we took a broader look at overall efficiencies we could make." Reynolds told Donavan that the Secret Service asked the postal service to "make some adjustments at the Kluczyski Federal building where the transition office is, so we could comply with security" restrictions. But -- writes Donovan -- there is good news: "Stand-alone blue boxes dotting the Loop will continue with regular pickups, including the final 5 p.m. timeslot." This would be good news... if in fact there were any stand-alone blue boxes still left in the Loop. Most of these disappeared after 9/11. If anyone reading this knows where a mailbox might be found on the street in the Loop, please leave a comment. Perhaps we can generate a list. If that won't violate some security protocol. 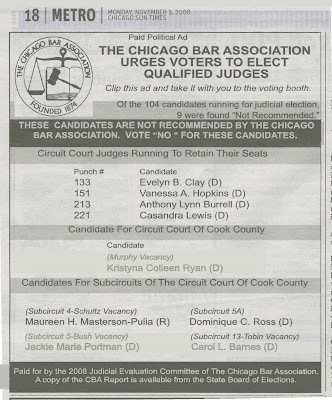 Four jurists targeted for removal by both the Chicago Tribune and the Chicago Sun-Times were retained by the voters in yesterday's election. Combining figures provided by Cook County Clerk David Orr and the Chicago Board of Elections, it appears that Judge Evelyn B. Clay received a 68.69% "yes" vote from the voters, easily besting the 60% retention threshold. Judge Vanessa A. Hopkins received a 74.24% "yes" vote in the City and a 66.20% "yes" vote in the suburbs for a combined favorable percentage of 69.92%. Judge Cassandra Lewis got a combined 68.55% approval rating and Judge Edward N. Pietrucha received "yes" votes from 65.40% of the Cook County electorate. These figures are taken from unofficial County results showing 2250 of 2290 precincts counted and unofficial City results showing 2504 of 2575 precincts counted. A quick survey of the other results showed no other retention candidate in jeopardy of losing his or her seat. According to figures posted on the website of Cook County Clerk David Orr, with 98.56% of the votes counted, Democrat Pat Rogers easily defeated Republican Maureen H. Masterson-Pulia for the Fourth Subcircuit Schultz vacancy. In the 15th Subcircuit, with 98.12% of the votes counted, Democrat Anna Helen Demacopoulous bested Republican Peter Fera, with a margin of over 32,000 votes. In the 12th Subcircuit race for the Devlin vacancy, with 97.64% of the votes counted, Democrat Pamela Elizabeth Loza appears to have bested Republican Laura J. Morask by just over 10,000 votes. The margins in the two contested 13th Subcircuit races were much closer. In the race for the Ryan vacancy, with only eight precincts still outstanding, Republican Annie O'Donnell was clinging to a 385 vote lead in her race over Democrat Ann Catherine Brady. As of 2:58 a.m., the Cook County Clerk's website showed O'Donnell with 56,208 votes to Brady's 55,823. The race for the Tobin vacancy is not quite as close. Republican Margarita Kulys Hoffman had a 1,488 vote lead over Democrat Carol L. Barnes 293 of 301 precincts reporting. Hoffman had 55,951 votes to Barnes' 54,463. 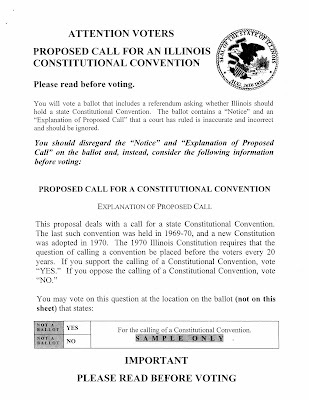 As you have probably heard, the CBA has filed suit challenging the form of the ballot for the referendum in the upcoming election about the calling of a Constitutional Convention in Illinois. The CBA has not taken a position supporting or opposing holding a Constitutional Convention. Our lawsuit is simply intended to ensure that the referendum is conducted in a fair and constitutional manner. The circuit and appellate courts have agreed with us that the form of ballot certified by the State Board of Elections is inaccurate, biased, and misleading. The courts have ordered that each voter, before voting, be given a "Corrective Notice" in the form [shown above]. All voters throughout Illinois are supposed to receive the Notice, including those voting by absentee ballot, Early Voting, and on Election Day. If you don't receive this notice when you vote, ask for it. This morning's ad tells voters which current sitting judges ("Judges Running to Retain Their Seats") that it finds "Not Recommended." But it also suggests that voters vote "no" on five other candidates, one running countywide, the other four running in subcircuit races. The problem is -- and here is where the ad can be somewhat misleading -- in three of these five races there is no other candidate. Kristyna Colleen Ryan, Dominique C. Ross, and Jackie Marie Portman were all assured of victory tomorrow when they won their primary races. There are no Republicans running against them; there are no Green Party candidates running against them. They are unopposed. Voters wanting to follow the CBA's recommendations in these races may be understandably confused: They have no one else to vote for. Kristyna Colleen Ryan narrowly outpolled the candidate endorsed by the Democratic Party, Paula M. Lingo, in a three-way race. Dominique C. Ross was not declared a winner in her neck-and-neck contest with former Cook County Bar Association President Stephen Stern until late August -- after a recount trial. Only Jackie Marie Portman's race was won by a relatively comfortable margin. She bested two opponents, Nkrumah Lumumba Hopkins and Furmin D. Sessoms. Sessoms had been appointed to the bench by the Illinois Supreme Court. In any event, the CBA can not influence the outcome of these three races at this point. And voters who usually vote only in general elections, and not in primaries, should remember, in the future, that many judicial elections are already decided when the polls close on Primary Day. Click here for 12th Subcircuit roundup post. The Council initially found Morask "not recommended" because she did not participate in the Alliance of Bar Associations screening process. Morask has said that she could not comply with the tight Alliance screening deadline because of a planned family vacation. But the new evaluation suggested that Morask had an ulterior motive for ducking the Council evaluation, namely, trying to avoid calling attention to past accusations of prosecutorial misconduct. I am dumbfounded that the Chicago Council of Lawyers would be so dishonest and misleading to the voting public as to print their "conspiracy theory" as to why I did not participate in their ratings. The simple fact is that had they or anyone else asked or researched the truth about these accusations at all, they could find that I had a full and complete hearing in the ARDC, the board that regulates conduct and was completely cleared. The chronology painted by the Council of Lawyers is a complete lie and extremely misleading to the public to say an intentional pattern of misconduct occurred. I have prosecuted the highest number of jury trials in Cook County and to have three cases (not nine) in which my sarcasm has been criticized is by far the best record of any attorney much less prosecutor. Only one of these cases was ever reversed and our office appealed it to the highest court. If one looks at the record instead of the conspiracy oriented drivel written by the Council you can see the following. People v. SanAntone Moss-prosecuted in October 1998-jury convicted, sentenced to death for multiple murder, Govenor Ryan communted in Mass Commutations. People v. Roy Fluker-prosecuted in December 1998-Conviction and sentenced to 35 yrs. People v. Evan Griffith-prosecuted in June, 2001, sentenced to life for second murder. People v. Griffith-appealed with affirmance (criticism of my conduct which was pursuant to pre-trial motions allowed by Trial Judge) in opinion issued in 2002 which was then appealed to the Illinois Supreme Court by the defendant where no less a person than the State's Attorney of Cook County made a special appearance to argue to the Justices on behalf of my integrity and lack of prosecutorial misconduct and to decry the misleading push to make it appear as if a pattern existed when in fact the above chronology demonstrates the simple fact that the three cases were prosecuted before the first opinion issued. In other words, I never flouted any court ruling or admonishment. This fact was recognized by no less august a tribunal than the ARDC, and the Chicago Bar Association and the Northwest Suburbuan Bar who all had the same exhaustive application wherein one must attach any complaints. It is dumbfounding to me that the Council of Lawyers violated their oath as responsible lawyers and citizens by printing what they did. Mr. Devine and every single judge involved in any of these cases will and has vouched for me repeatedly to the bar associations that are the major peer reviewed bars-the CBA, and NWSBA. The Alliance has demonstrated on prior occasions their agenda as a mere glance at their application reflects a bias that is not appropriate for judicial candidates. Unlike my opponent I have sat on the judicial evaluation and investigation committees of many of the Alliance and the CBA. In the race for the Ryan vacancy in the 13th Judicial Subcircuit, Republican Annie O'Donnell opposes Democrat Ann Catherine Brady (at right). Annie O'Donnell is "Qualified" for the office of Circuit Court Judge. Ms. O'Donnell was admitted to practice law in Illinois in 1987 and has extensive experience in criminal law. Ms. O'Donnell is knowledgeable, hardworking, and possesses all the requisite qualifications to serve as a Circuit Court Judge. Annie O'Donnell received her license to practice law in 1987. She has been a solo practitioner engaged in criminal defense work since 1995. Before that, she served as an Assistant Cook County Public Defender. Ms. O'Donnell has good legal ability and a good temperament. The Council is concerned about the narrowness of her practice, including lack of sufficient courtroom experience in complex matters. The Council finds her Not Qualified for the Circuit Court. Ann Catherine Brady is “Qualified” for the office of Circuit Court Judge. Ms. Brady was admitted to practice law in Illinois in 1987. Ms. Brady is well regarded for her legal knowledge and ability and possesses all the requisite qualifications to serve as a Circuit Court Judge. Ann Catherine Brady has been a lawyer since 1987. She has handled principally domestic relations cases in private law firms throughout her career. Lawyers report that she has good legal ability and a good temperament. The Council is concerned, however, that her practice is narrow and too often involves non-complicated litigation matters. She has no jury trial experience. The Council finds her Not Qualified for the Circuit Court. The Chicago Sun-Times endorsed Brady in this race. The Chicago Tribune said, "Democrat Ann Catherine Brady and Republican Annie O'Donnell are capable, experienced lawyers, each with 21 years of private practice. A slight edge goes to O'Donnell for her broader range of litigation experience as a criminal defense lawyer and public defender. She is endorsed." I have been unable to find a website for O'Donnell. Brady's website can be found at bradyforjudge.org. There are two contested judicial contests in the northwest suburban 13th Judicial Subcircuit. In the race for the Tobin vacancy, Democrat Carol L. Barnes (at left) will face Republican Margarita Kulys-Hoffman. Kulys-Hoffman is already serving as a judge, having been appointed to the post by the Illinois Supreme Court and, in September, being elected as an Associate Judge of the Cook County Circuit Court. Barnes did not participate in the Chicago Bar Association evaluation process and was automatically found "NOT RECOMMENDED" as a consequence. She also did participate in the Alliance of Bar Association evaluation process; she was therefore found "not recommended" or "not qualified" by each of the Association members including the Chicago Council of Lawyers. Judge Margarita Kulys Hoffman is "Qualified" for the office of Circuit Court Judge. Judge Hoffman was admitted to practice law in Illinois in 1983 and practiced law for 23 years before her appointment to the bench in 2006. Judge Hoffman has extensive experience and is highly respected for her knowledge of the law, work ethic, integrity, and fine judicial temperament. Margaret Kulys-Hoffman has been a lawyer since 1983. She was appointed to the bench by the Illinois Supreme Court in 2006. She currently presides over traffic court and misdemeanor courtrooms in the Rolling Meadows courthouse. The Council, in an earlier evaluation done before she took the bench, found Judge Kulys-Hoffman Not Qualified due to insufficient litigation experience. The Council’s current evaluation is based on her performance as a judge. She is considered by lawyers appearing before her to have good legal ability and temperament. She is praised for her courtroom management skills in high volume courtrooms. The Council finds her Qualified for the Circuit Court. The Chicago Tribune and the Chicago Sun-Times both endorsed Kulys-Hoffman. Kulys-Hoffman's website may be accessed at www.judgehoffman.org. Barnes' website is found at www.votecarolbarnes.com. In Cook County's Fourth Judicial Subcircuit, Democrat Pat Rogers faces Republican Maureen Masterson-Pulia. Again, the disparity in the photograph sizes is due to my technical limitations and not to any preference of any kind. Patrick Toal Rogers is “Qualified” for the office of Circuit Court Judge. Mr. Rogers was admitted to practice law in Illinois in 1983 and has practiced law for 23 years. He has a diverse practice and possesses the depth and breadth of legal experience to serve as a Circuit Court Judge. Pat Rogers was admitted to practice in 1983. He has been in private practice since 1988 and, is currently a solo general practitioner handling municipal, criminal and traffic cases. From 1983 until 1988, he was an Assistant Cook County State's Attorney. Since 1993, he has been a Supervisor for the Township of Lyons and also serves as an Administrative Hearing Officer for several other cities. Mr. Rogers is considered to knowledgeable about his practice areas, which are mainly limited to traffic and municipal matters. His integrity is unquestioned and he has a good temperament. The Council is concerned, however, that he has little experience in complex litigation matters and does not have the range of experience necessary to be judge. The Council finds him Not Qualified for the Circuit Court. Maureen Masterson-Pulia is “Not Recommended” for the office of Associate Judge. Ms. Masterson-Pulia was admitted to practice law in Illinois in 1994. Prior to her legal career, the candidate served as a Village Clerk and Village Trustee. She has good management skills and is articulate and poised. She has worked as an arbitrator for the Illinois Workers’ Compensation Commission for the last six and a half years and is well regarded for her timely and well-written decisions. Ms. Masterson-Pulia is a fine candidate but needs to acquire some litigation experience. Pursuant to Section 27.4 of the JEC Resolutions and Procedures, a candidate who has been evaluated and found "NOT RECOMMENDED" for the office of Associate Judge and who shall within two years of such a finding be a candidate for Circuit Judge shall be found "NOT RECOMMENDED" without hearing. The Tribune and the Sun-Times have both endorsed Rogers. In Thursday's Chicago Daily Law Bulletin, John Flynn Rooney reports that Rogers has raised $192,452 for this campaign, including a loan by the candidate to the campaign of $18,987 in late September. Masterson-Pulia has raised $15,381, according to that same article. Pat Rogers' campaign website is at www.electpatrogers.com. Maureen Masterson-Pulia's website is maureenforjudge.com.